Our apologies for not having updated the website in a while. So many things have happened already, and the year isn’t even over yet! We’ve had the following events: our annual “Pistahan” gathering, Integrationsdag 2015, and other integration-related activities such as the Watercolor event for kids with artist Rachelle Åstrand, language classes, and of course, the Filipino-Swedish cooking workshops. For those who attended any of these events, a huge THANK YOU to you! 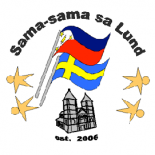 We truly enjoy organising these activities in order to keep the camaraderie alive within our small community, and to share wonderful aspects of our culture to our Swedish friends and families. We have many more events lined up for the following months, so please always check the website and our Facebook for up-to-date announcements! More cooking workshops (for kids, as well! ), another watercolor session (this time, for the kids-at-heart), language classes, and social events such as a Halloween costume party and our annual Christmas potluck party! 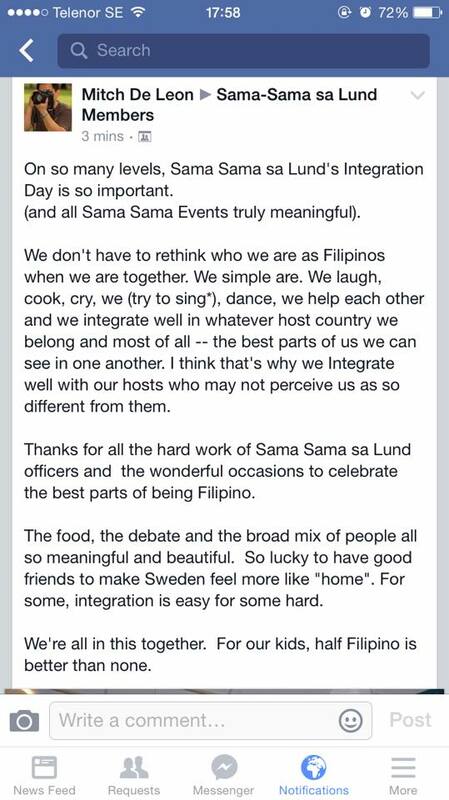 This entry was posted on September 29, 2015 by Sama-sama Sa Lund in Events, Integration and tagged culture, filipino, filippinerna, filippinsk, integration, sweden.